Backsplash Advice For Your Bathroom - Would you tile the side walls too? 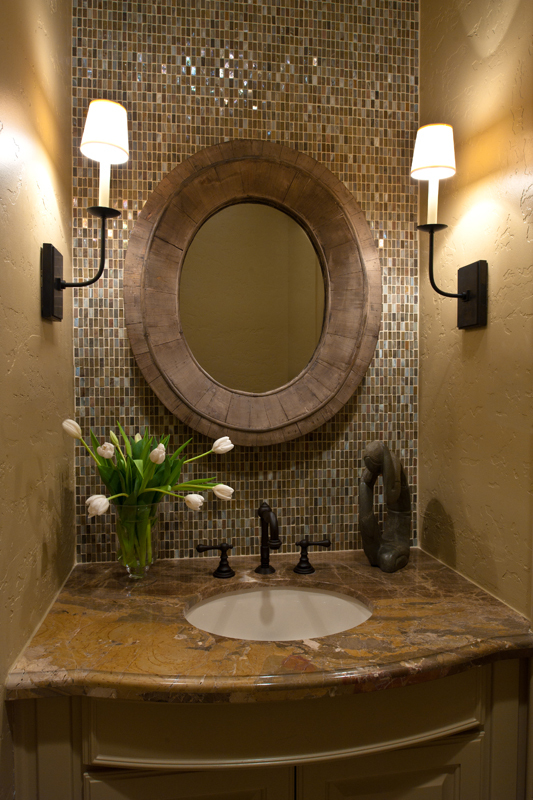 I recently had a reader contact me regarding some of her bathrooms where she is now adding tile backsplashes. I asked her if I could share her images and questions here because I thought many might be interested in all these variables and circumstances that are considered with clients on various projects. You might just find YOUR particular situation described below. These are the two images below that she submitted as examples. These weren't her bathrooms. 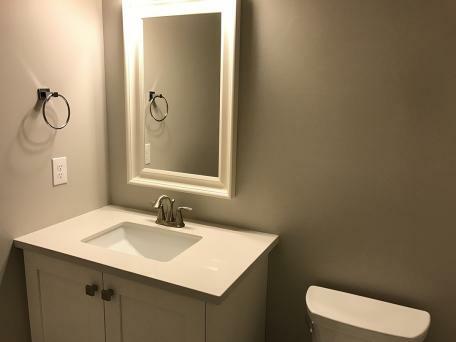 Is the sink really close to the side wall? Is it a master bath, guest / secondary bath or a powder bath? What materials are you using on the walls in both cases? Who will be using the bath and will it be used on a daily basis? Kids splash water around a lot. If children are using any bath regularly, some protection is needed. I'm doing a beautiful hall bath now that a little 6 year old boy will be using. We're tiling the walls all the way around the bathroom up to 4'-6". :-) I did the same in my daughter’s bathroom upstairs. If it's a powder bath or a bath that is used by guests, I would say they'll likely be more tidy and you don't have to worry as much about splash. If you're using wallpaper, that gives some protection on the wall and you can get away without doing a splash. I have no backsplash at all in my powder bath that has a pedestal sink with wallpaper on the walls. I’ve never had any water issues there and we use that bathroom a lot. On the first image you submitted, the smaller bath, I might likely do a side splash if that bathroom will be getting used a lot, particularly by a child or teen. In the other bathroom, likely a master bath, I probably wouldn't do one, but could, since it's surrounded on 3 sides. This now depends on what you're doing on the walls really and on the rest of the room. If it's just paint, I might be inclined to side splash it. If it has tile on the back wall as a feature, like in the photo, I likely wouldn't do it. “Oh, how silly of me to think there was a cut and dry answer. :) I was able to get pictures of the actual spaces today, so I'll post them here and see what you think. There is a master bath with two sinks and two side walls on the counter. A kids bathroom with one sink and two side walls. And a powder room with one side wall touching the counter. Everything is painted. There is no wallpaper planned for these spaces. On the master I was going to do a light grey 3x12 tile, vertical 1/3rd brickset, counter to ceiling. I was thinking of doing all 3 walls, but one of the side walls has a door frame with header on it and not sure how to deal with that, so thought maybe just do the back wall." Master bath with double sinks - Tiling the back wall to the ceiling, should she tile the sides too? On the master, I would likely not do the side splash. The wall of tile you’re doing over the sink area will be a nice statement and has a more high end look. Tiling the side walls will sort of take away or diminish the impact of the back tiled wall. Besides, I always prefer to transition materials on an inside corner wherever possible and this is the perfect place to do so. You could, however, do a small splash in the same material as the countertop and then tile on top of that, leaving a backsplash of the countertop material with no tile above on the sides. I wouldn’t go with 4” here then, that’s just tooooo typical. I’d go shorter, like 2” - 3”, just enough to cover the joint and protect the corners where water will possibly pool where countertop meets sheetrock. I would prefer the first recommendation I offered, as I’m not too fond of side backsplashes or slab backsplashes with tile above, particularly in kitchens, but if you feel you need protection there from the sink because of a user that wouldn’t be careful, then you could go the direction of the latter recommendation. In that case, the splash would sort of blend in visually with the countertop. "On the kids bath I was going to do a 3x5 white subway, brickset, and do all 3 walls from counter to ceiling, and line up the edge of the tile with the end of the counter. (This is actually a jack and jill with two sink areas that are the same, except one has doorway on both side walls and one of them just has a doorway on the left sidewall.)" I understand that with the kids’ bath, you want some protection on the sides. Just make sure you use a bullnose piece at the outer edge, lined up with the countertop. I prefer the bullnose piece to be this type, pictured below, with the bullnose on the short side (I assume you are laying it horizontal), as opposed to one of those longer 2 ½” bullnose trimpieces that sort of look like they border the tile. "On the half bath, I was going to do a 12x24 wavy texture white tile, stacked (contempo mashup) and do the entire back wall, including behind the toilet area from floor to ceiling. I had also thought to do that side wall just where it touches the counter, from the counter to the ceiling, lined up with the counter and do a pencil white trim piece all the way up that side to hide the tile edge." In this case, I think the side wall tile application will really take away from the impact the full back wall of tile will have. I would use a paint that can be somewhat washable, like a Sherwin Williams Emerald Matte finish. It’s washable, but not shiny. I've done a few bathrooms where we tiled the back wall only and it highlights the tile nicely and makes a big impact. You might want to think about a different mirror if you haven’t already. That one might look a little chunky on a wall of tile with its heavy frame. Something a little sleeker might be nice so that your impressive tiled wall will stand out. Many of my posts contain my design preferences and guidelines that I use to design by. Design decisions, however, are always affected by the specific situations of the project. Situations like client preference, functionality, surrounding spaces, budget, etc. Design is not a one size fits all, but if you use some basic principles to guide you, the answers usually come to light. Here's a post below, that explains why my design solutions might lean one way in one situation and another in a different situation with a different set of circumstances. Am I flip flopping on interior design decisions? Just because I explain a design solution in one blog post, doesn't means it applies exactly the same way in every situation out there. It does, however, mean that it can occur in most and it always comes with some kind of proof. NEED MORE HELP ON KITCHEN BACKSPLASH DESIGN? Check out this content upgrade on backsplashes, available in my outlet shop. 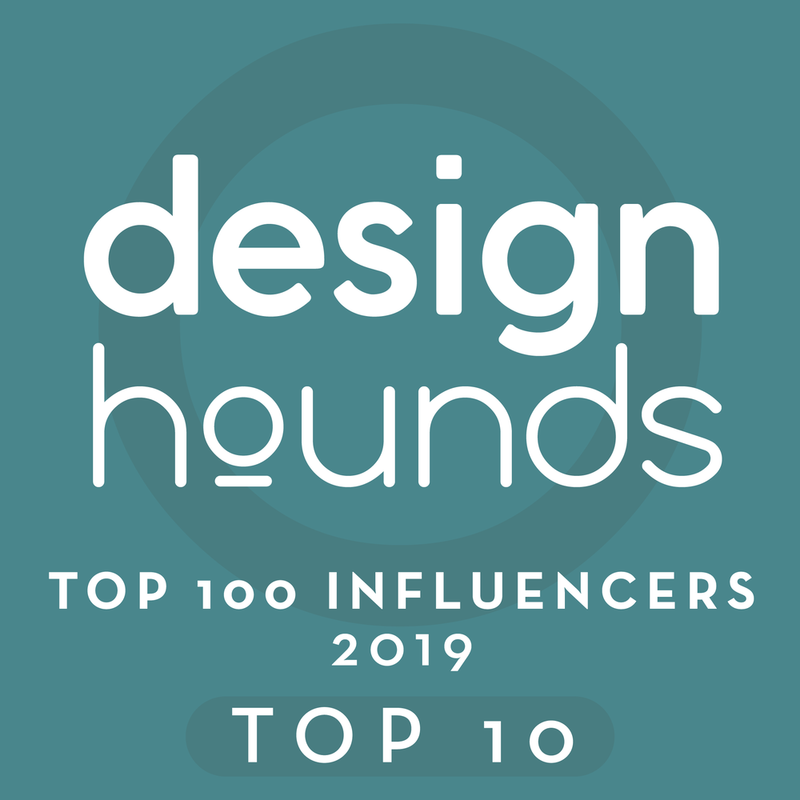 I've written so many posts about them, including Designed in a Click reader Q and A example posts, that I can't keep track of what I've written. I finally took some time to assemble them all here in this downloadable pdf for sale in my outlet. If you need a guide to help you make some decisions on your backsplash design, you should check it out. Subscribe to my blog for interior design tips, advice, and inspiration served directly to your inbox twice a week.